Or by category of member such as New / Joined / Dormant/ At risk / Infrequent/ Loyal / frequent. You may also search member by Name, Email and Phone to specify an individual member to view. 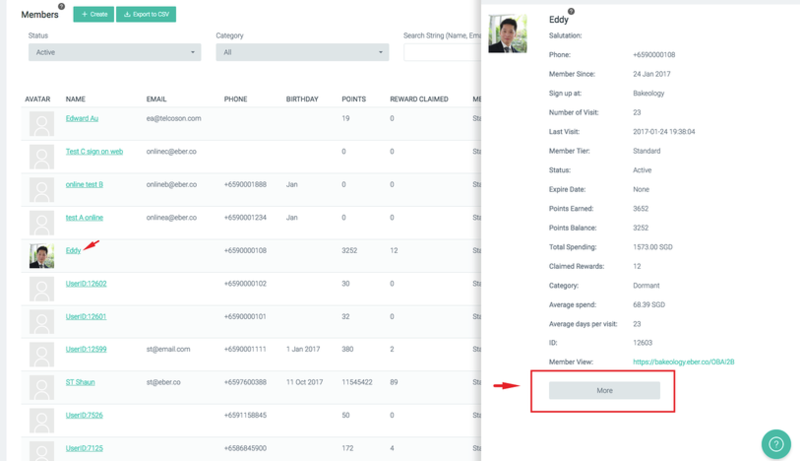 To view more on selected member details, click on the member "Name" a side panel will pop out on the right, you may click on [more] on the bottom to view members Information and transactions. **You may resend your Welcome SMS to your new member's mobile if they have deleted accidentally or did not receive it. Creating new member from business admin will require to send Welcome SMS manually. click on [Resend Welcome SMS]beside mobile number in Member info. In certain situation, you may need to make adjustment to individual member points or gift card value. You will be able to "Add" or "Deduct" under each tab, you can add in note to state the reason on the adjustment for record purpose as well. You may archive your member data when your existing member account is classified as inactive or banned by your business decision. * Please note that archived data can not be reinstate back to the system.